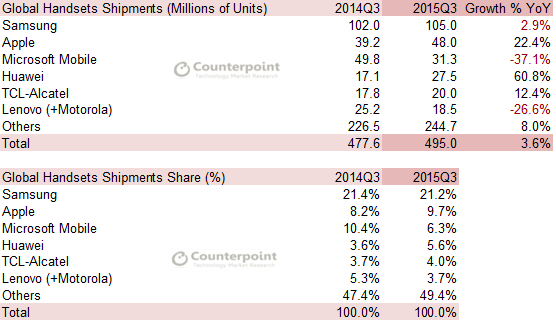 Counterpoint Research team of Analysts have completed preliminary sizing of the global handset and smartphone market as few OEMs have already released their Q3 2015 (July-Sep) performances. Following are our preliminary market share and rankings according to our quarterly Market Monitor service. Emerging markets such as India, Indonesia, Nigeria are hot destinations for OEM’s which are moving beyond domestic boundaries in quest for expansion. Chinese brands continued to rise with aggressive go-to-market strategies, with some brands strongly benefiting from e-commerce channels in emerging markets whereas some mature Chinese brands through carrier channel partnerships in markets such as USA, Europe and Latin America. Chinese brands such as Huawei, ZTE, Meizu were the fastest growing brands during the quarter and moved up the rankings significantly while brands like Lenovo, Coolpad continue to face stiff competition. Apple posted its strongest ever fourth quarter for both revenue and sales for iPhone with shipments at 48 Mn during the quarter, a Y-o-Y increase of almost 22.4% and above the market growth. Apple iPhone revenues were at 63% of the total Apple revenues, depicting importance of iPhone’s performance for total corporate performance . In emerging markets China recorded a string growth YoY with shipments in India, Vietnam and Indonesia alone increasing by 96%. Apple fringe business segments like Services and other products are on track to become more than $30 Bn revenue in 2015 which is more than Xiaomi, Huawei and Lenovo combined. 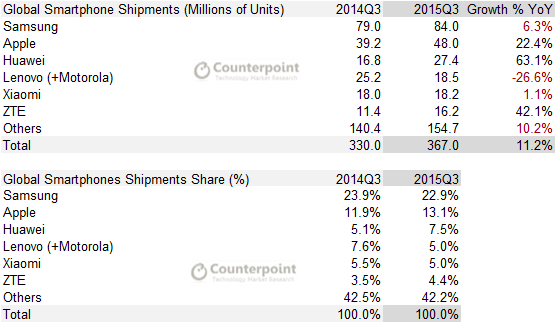 Huawei continues to be among top three smartphone brands globally with a market share of 7.5% and YoY growth of 63%. Apart from this the strong growth in China amid the slowdown led Huawei to Top position in China Smartphone market in Q3 2015 surpassing Xiaomi. Honor brand is yielding results for Huawei with a presence in more than 74 countries around the globe and contributed to more than a third of the shipments. Huawei’s volumes increased by 4% in China as the vendor remained aggressive on pricing and distribution to capture market share at the same time strengthening its retail presence in recently entered markets in APAC and MEA region. North America remains a weak spot for Huawei and it needs to focus on the region if it has to narrow down the gap between top 2 smartphone brands. During the quarter Huawei gained share in mid to high end smartphone segment which is a positive sign for the company as it will push the overall ASP of its handset business and thereby improving profit margins. Moreover the recent launch of Nexus 6P will help it to scale up further thereby giving Huawei immediate presence in price segment where it has been struggling to get hold of in recent years. Xiaomi continues to be among top 5 in smartphone segment surpassing Lenovo ,ZTE & LG in Q3 2015 shipping 18.5 million smartphones with a market share of 5% during the quarter. 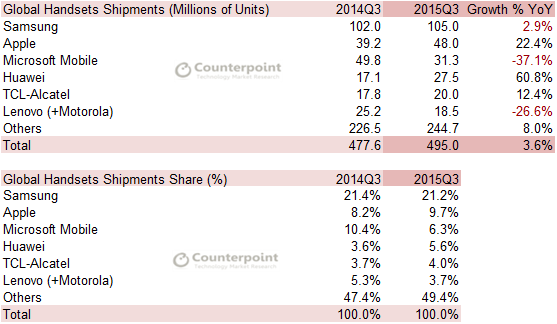 With YoY growth of just 3%, Xiaomi is struggling to gain scale beyond China. Xiaomi saw healthy shipments for its newly launched Redmi Note 2 in China which led the Chinese brand to keep its momentum in China. Although much of sales are still coming from Online channel, Xiaomi is consistently trying new strategies outside home market to drive volumes. Some of these strategies includes tying up with Tier One National distributor, Redington, for offline distribution and partnership with Foxconn to manufacture locally in India which is its biggest market outside China currently. During the quarter it entered Brazil where we can expect it to go with a mix of offline and online distribution structure through operators and other offline channels. However going forward it will continue to invest in regional content platforms in countries like India and Indonesia and at the same time expanding in new regions like MEA. Lenovo (+Motorola) smartphone shipments were down 26% annually as Lenovo continued to suffer an onslaught from Huawei & Xiaomi in its home market, China.